Trinity Rose Designs: Your Next Stamp October New Release Blog Hop!! 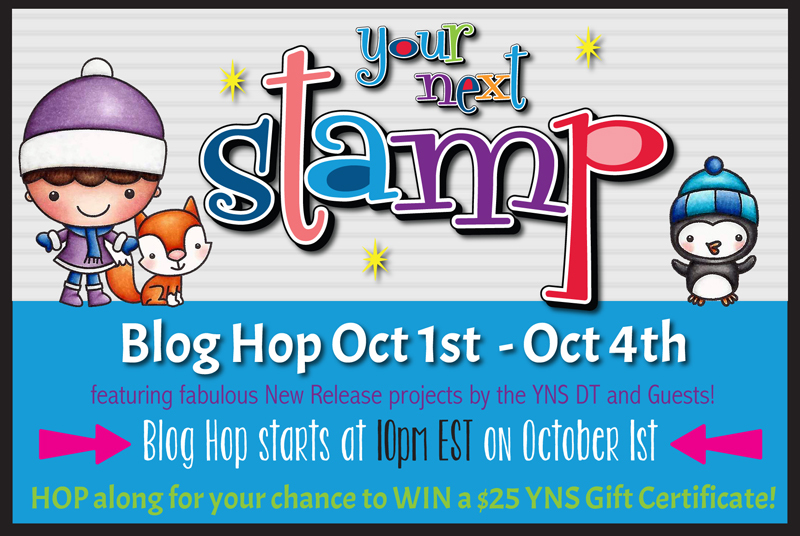 Welcome to the Your Next Stamp October 2016 New Release Blog Hop!! All the new products are available NOW! Im so in love with this sweet release! The Dies are to Die for, and our new Ink Pads Stamp so crisp and beautifully, but my Current fave is for sure the Premium Dye Ink Pad - Black Olive, because you can use it with Copic Markers!! And the stamps are insanely Adorable! Can you say "Too Cute For Words"! 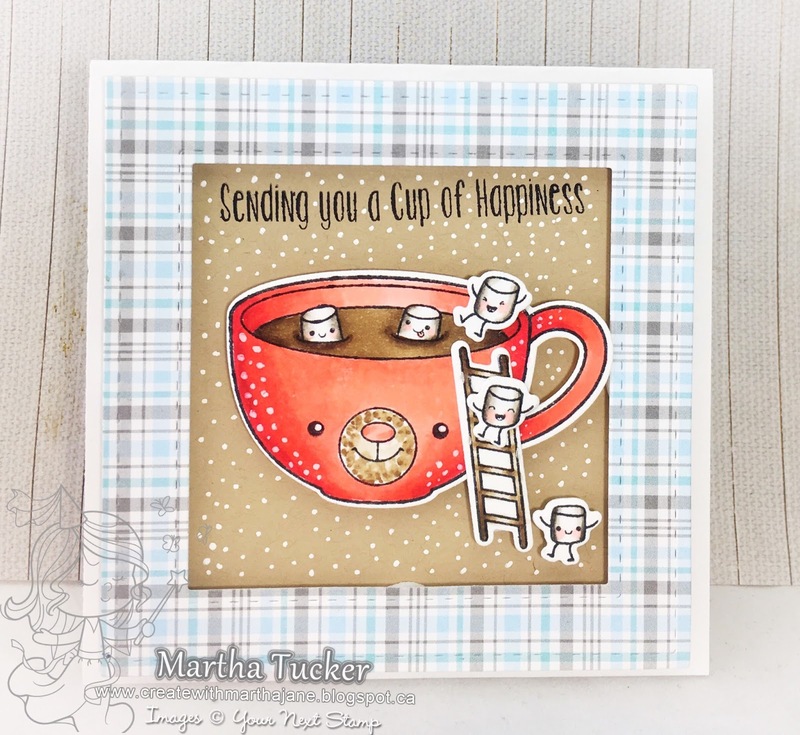 And here is my Second Card using these YNS products. Did you know you can Win a $25 YNS gift certificate to our online store?? 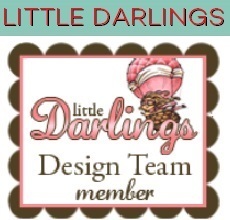 Just comment on all the Design teams blogs as you hop along and you will be entered to Win!! Have fun Hoppin and Shoppin! First card is my favorite!!! Both cards are adorable, Martha. But the bear cup made me smile! Would love a gift card for YNS - love the new release ! I am seriously obsessed with those little marshmallows! Such sweet cards! I love the speckled red cup!! Fun and cute cards. Enjoying all he inspiration. I love that bear cup - so adorable. And the mice, too, very sweet. Love your darling cards. The mice playing in the wreath is darling. Oh these are so cute! Love those darling marshmallows! Hi Martha!! I love both your cards!! They are both so adorable 😊 And you're right the cup of happiness is too cute for words!! Thanks for the inspiration. Your swimming marshmallows are too funny! I love the little ladder! Love your cards. The cocoa cup is toooo cute and so is the mice card. TFS. OMGosh, you're right--they're just too cute for words!!! Your cards are absolutely adorable! Ok, the cup of happiness and those mice are so adorable. I need those two sets. What a unique way of using the little marshmallows. Love it. Love your cards! The wreath card is absolutely adorab l e! I love the paper choices on both cards. ADORABLE!!! Those little marshmallows are tooooooo cute! Both of these cards are fabulous! Soooooo much cuteness here! The first card is my favourite - I just love this new set! Your second card is adorable too! The extra-large coffee cup and marshmallow men adorable! Cute cards. I like your coloring and choice of papers. Darling cards! Love the cute marshmallows and the fun wreath! Such Happy and fun creations! Love the new release! What a fun holiday release. Your cards are so cute. Adorable cards! Love those marshmallows and those mice! Adorable cards. The marshmallow party cracks me up. Such darling cards! 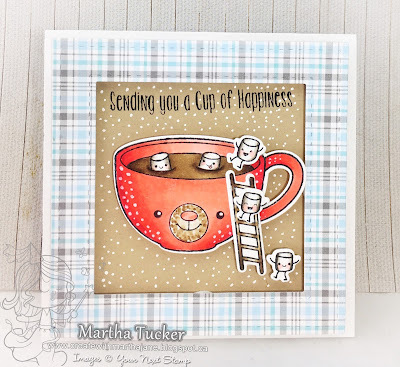 I love that Cup of Happiness set, especially! cute marshmallows climbing... How fun. Love your cards. What fun, adorable cards. Love the ladder with the marshmellows! Adorable cards and I love the little marshmallows! So very cute. Great cards. Love the marshmallows using a ladder to get into the bear cup. Thank you for sharing. Beautiful cards! So very cute! Love the plaid!